Penelope vetula Wagler, 1830, Mexico. Four subspecies. 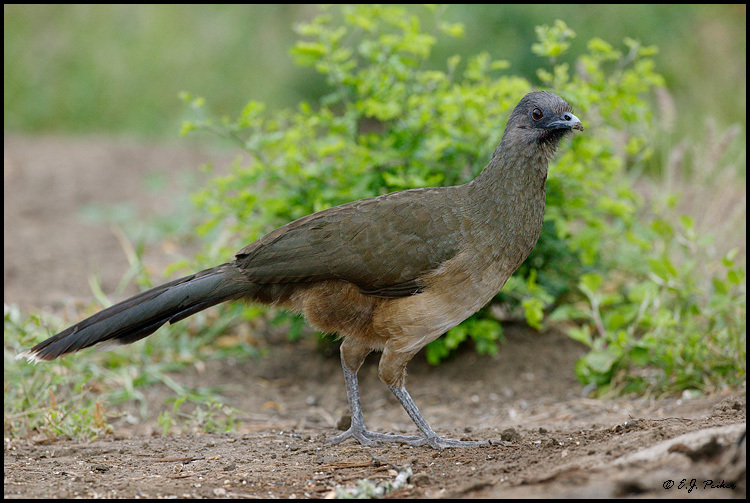 English: Common chachalaca; French: Otalide chacamel; German: Blauflьgelguan; Spanish: Chachalaca Norteсa. 19–22.8 in (48–58 cm); 15.5–28 oz (440–794 g). Plain coloration, races vary in size and color. 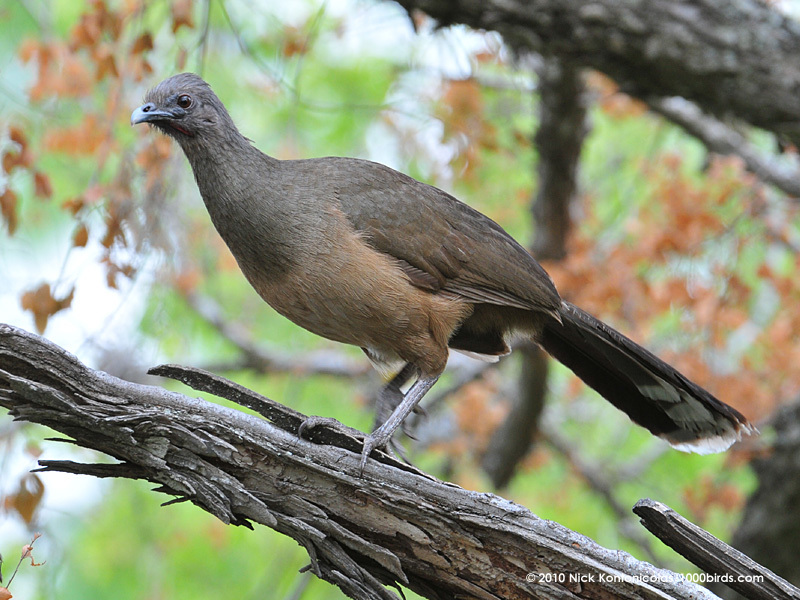 This species ranges from south Texas to eastern Mexico and Costa Rica. Scrub and tall brush vegetation. 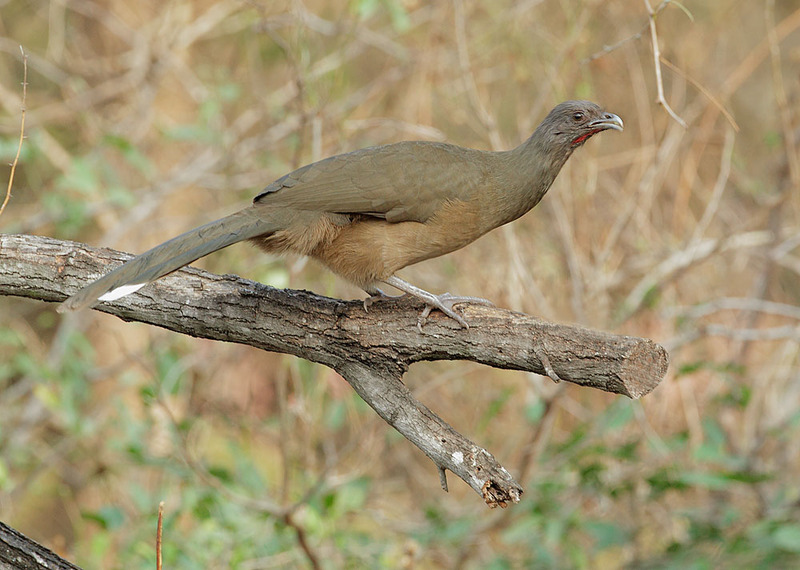 Also occurs in lowland and pre-montane forest in Central America. 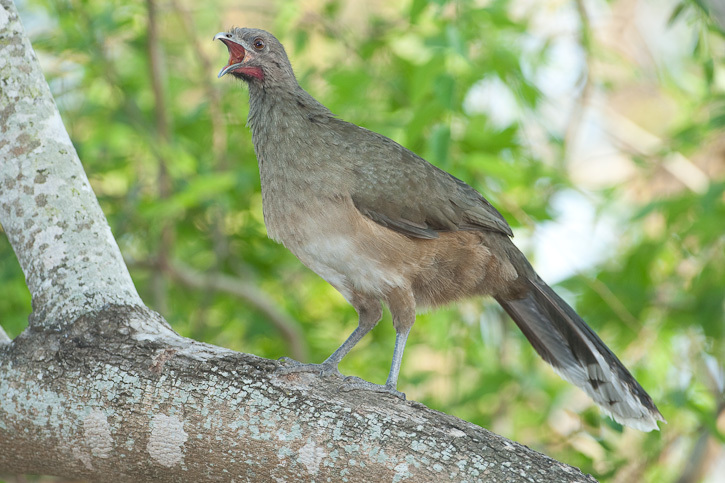 The full morning chorus of the plain chachalaca (Ortalis vetula) is unforgettable. 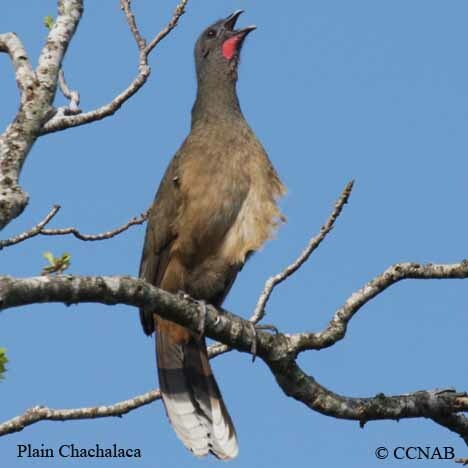 One of these birds, sitting in a tree above dense secondary growth, calls with a rough, unmelodic, but remarkably strong voice, “cha cha lack, cha cha lack.” The neighbors take part and a real din of loud calls arises. When those nearby have become quiet, one hears other more distant voices. The chorus seems to decline until from a distance of over half a mile (1 km), one can hear no more. Then the noise surges back with increasing strength and finally an earsplitting din is produced by a group of six to eight of the birds situated vertically above the observer. Fleshy fruit comprises much of their diet. Also green leaves, buds, shoots, and twigs. Some insects. Nests are most often built in trees 3.3–33 ft (1–10 m) off the ground. The nest itself virtually nonexistent, with birds often laying eggs on bare limbs. The clutch size is typically two to four eggs with an average incubation of 25 days. The Utila Island subspecies (off north Honduras) population has declined, and is possibly extinct.